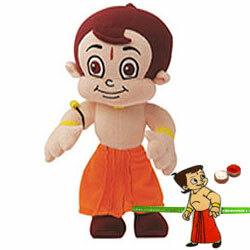 Send this nicely presented gift of Wonderful Chota Bheem Soft Toy and let someone know that you have feelings for him. This Chota Soft Toy made in amazing design will surely make your young daughter dance. It is suitable present for your young daughter. The size of this Toy is 30cm with Choota Bheem Rakhi and Roli Tilak Chawal.